A couple of months ago I put together a book for my dad’s 50th birthday of stories from his friends and family. Out of the 75+ stories that I collected, I would say that at least half of them mentioned some sort of basketball related story. And it’s not just my dad; my family is full of basketball fanatics, from a brother who played college basketball to another brother who got married on crutches because he had to go play church basketball the night before his wedding. 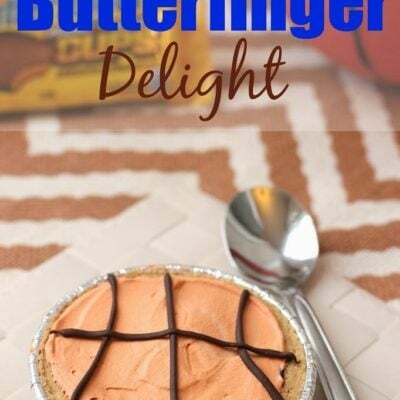 So when I was asked as part of my #CollectiveBias membership to create a basketball themed recipe using the new smooth and crunchy Butterfinger Cups, I decided to put two of my family’s favorites together to create a dessert perfect for basketball parties, basketball Butterfinger Delight. Striped delight is one of my all-time favorite desserts and the addition of the Butterfinger Cups just takes it to another level by adding a delicious crunch to the pudding layer. 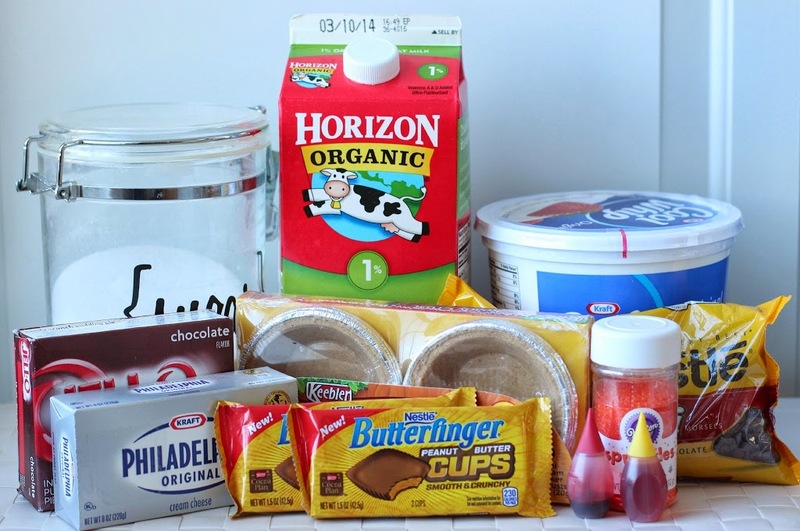 All you’ll need to make your own Butterfinger Delight is Butterfinger Cups that you can pick up at Walmart, cream cheese, Cool Whip, sugar, milk, graham crackers or premade graham cracker crusts, and instant chocolate pudding. And if you want to decorate them like I did, sprinkles, food coloring, and chocolate chips. Once you’ve gathered your supplies, make your cream cheese layer by mixing the cream cheese, sugar, milk, and Cool Whip together. I recommend putting the final mixture into a plastic baggie to use for piping the mixture into the crust layer; this keeps everything so much cleaner when you’re putting the pies together. After you’ve made the cream cheese layer, make your chocolate pudding. 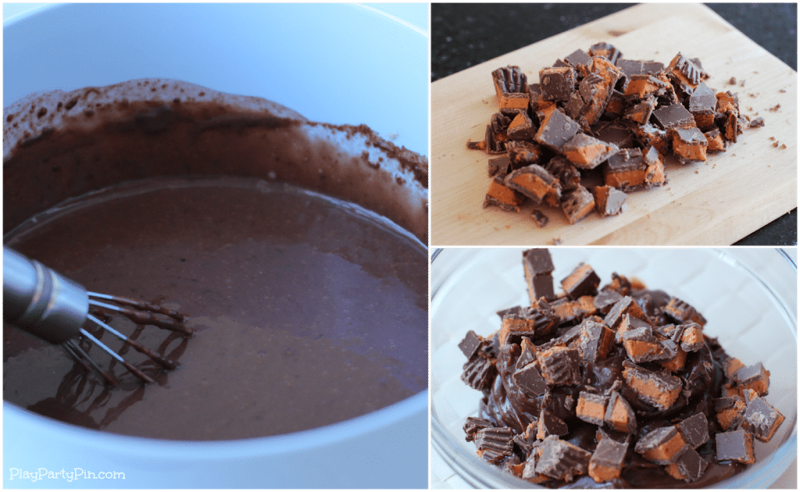 While the chocolate pudding is chilling (about five minutes), chop up your Butterfinger Cups. I recommend chopping them up into chunks about half the size of the chunks pictured below. Once your pudding is chilled, mix the chopped up Butterfinger cups into the pudding. 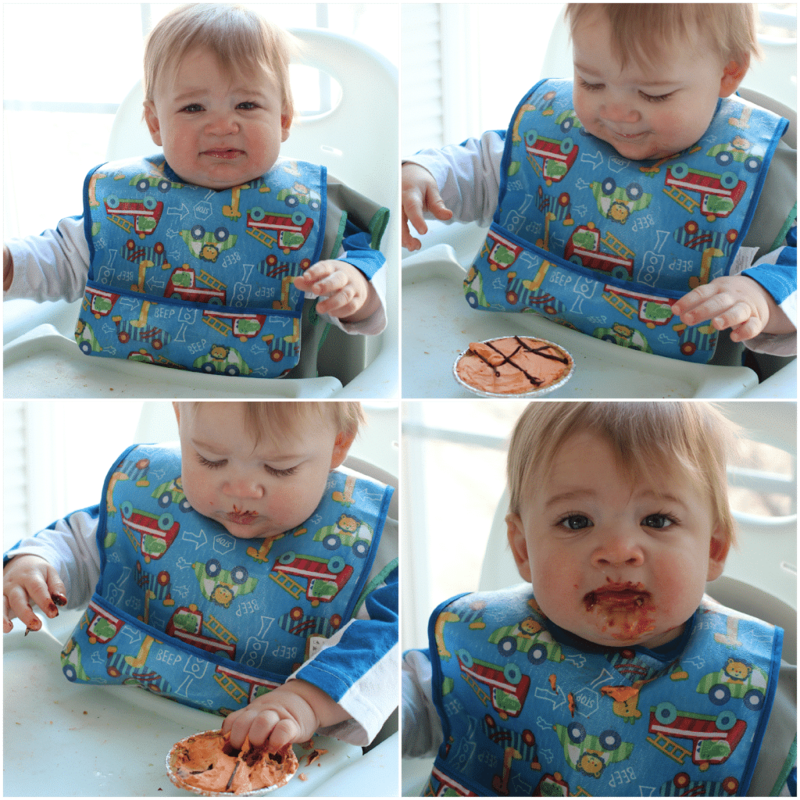 And if you don’t want to cut up the Butterfinger Cups, just leave them within reach of your 10-month-old. The ones on the ground were nice and broken up, perfect for this dessert. 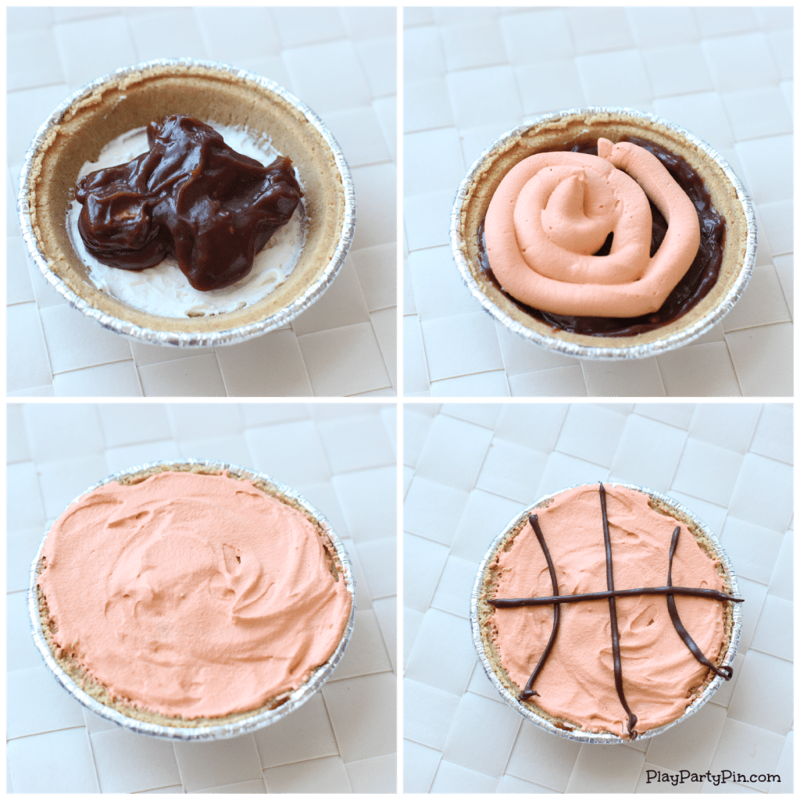 Finally, mix food coloring into half of the Cool Whip to create the orange color you’ll want for your basketballs. After you have all of your components complete, start putting the Butterfinger Delights together. Add some of the cream cheese layer on top of the graham cracker crust, top that with the chocolate pudding layer, and finish it off with the orange Cool Whip. 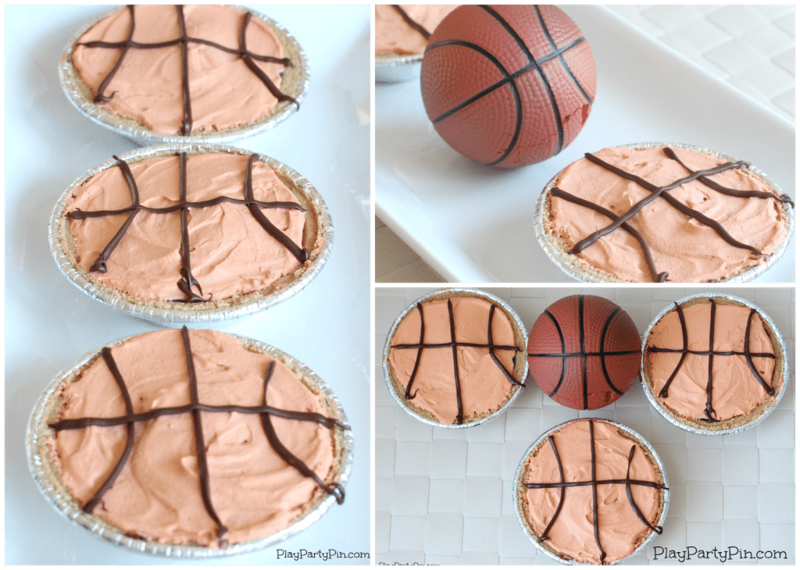 Make them even more festive by melting chocolate chips and creating chocolate basketball lines on top. 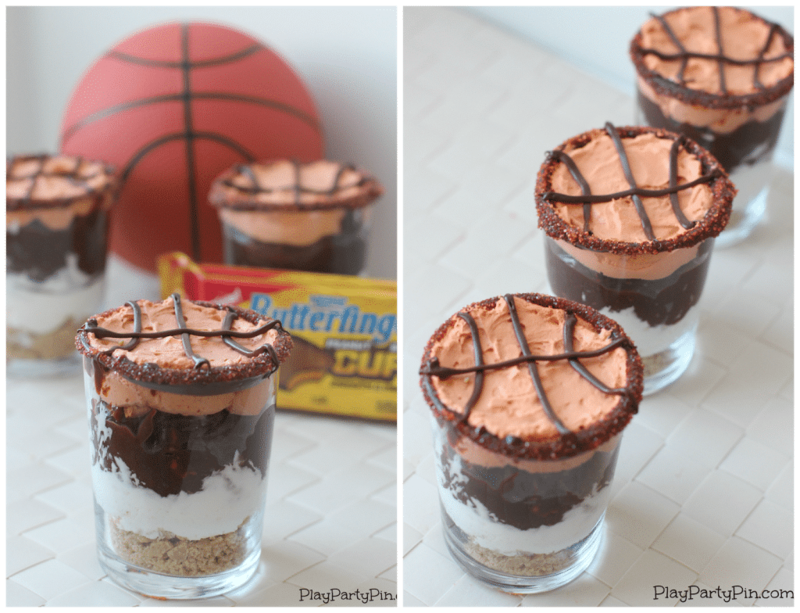 These little Butterfinger Delights would be perfect for watching basketball with your friends. You can make one big pie, but I personally prefer the individual ones so everyone gets their own. 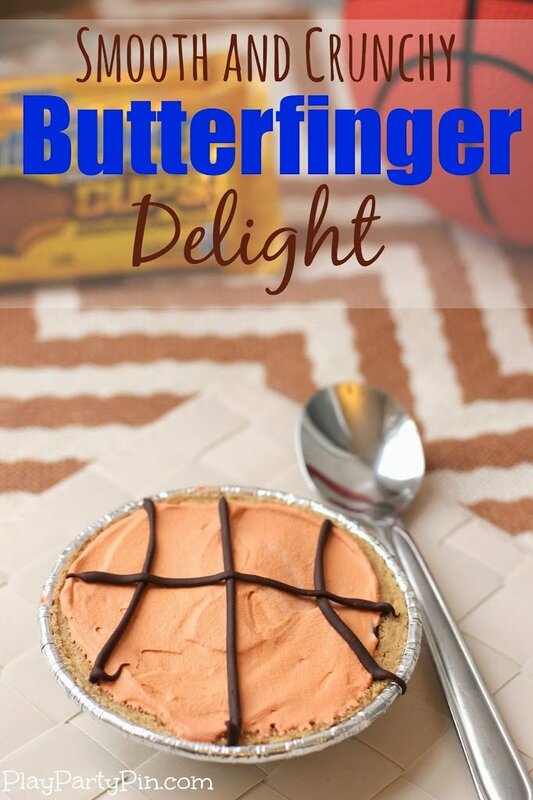 And if you want to take it up a notch for a basketball party, put these Butterfinger Delights in chocolate and sprinkle rimmed glasses so that everyone can see all of the fun layers inside. Since I’m still not eating sweets, I decided that K could be my taste tester since he waited patiently, okay not so patiently, as I made them. 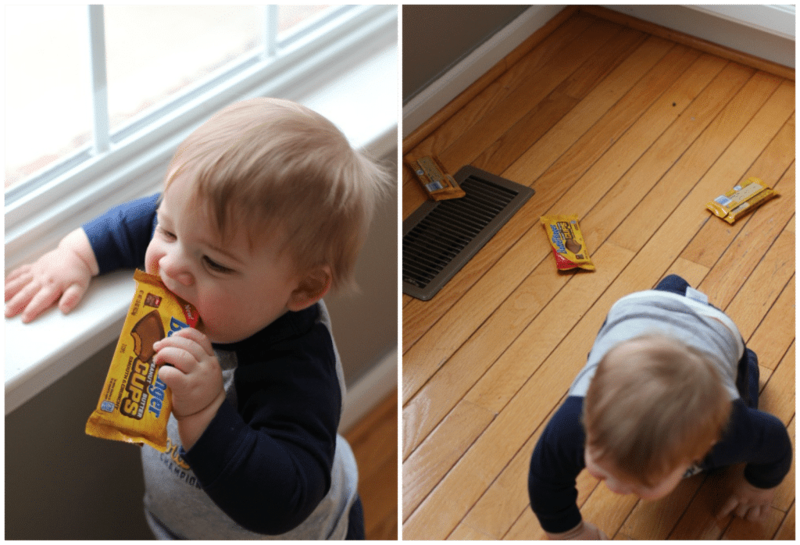 He liked the Butterfinger Delight much more than the Butterfinger Cups in their wrappers, definitely one of our #NewFavorites. You can find more fun recipes and ways to use Butterfinger Cups on the Walmart or Nestle Flavorful Moments websites. Make your graham cracker crust by following the instructions on the package. If you are using a pre-made crust, skip this step. Mix cream cheese, 2 T milk, and 1/4 cup sugar in a large bowl with a mixer until well blended. 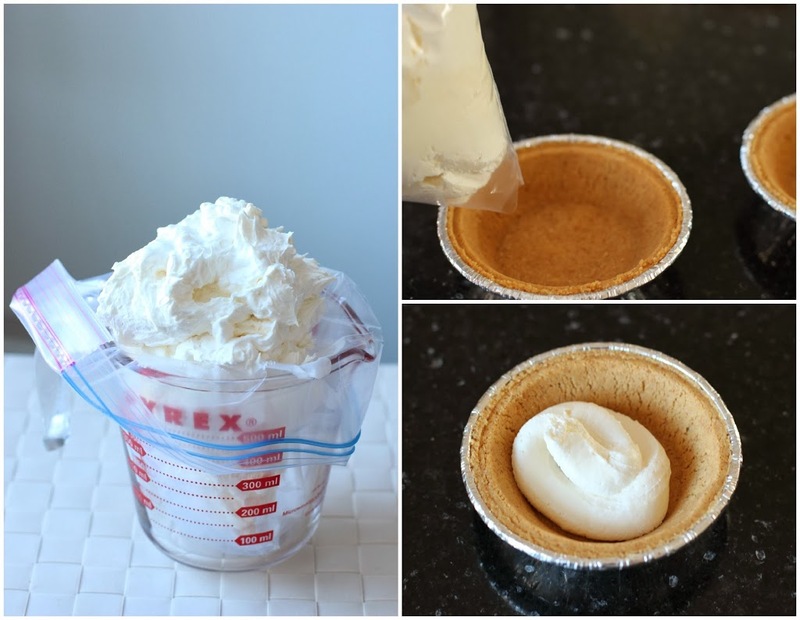 Gently fold in half of the whipped topping. Spoon over graham cracker crust. Pour 2 3/4 cup milk into large bowl. Add dry instant pudding mix and stir until well combined. 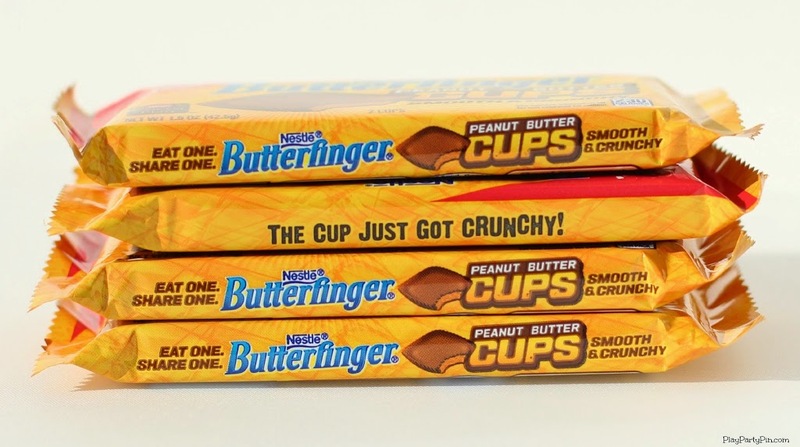 Chop Butterfinger Peanut Butter Cups into small pieces. Stir into chocolate pudding. Add chocolate pudding layer on top of the cream cheese layer. Top with remaining whipped cream before serving. Store leftover pie in refrigerator. These are so cute! I am allergic to peanuts but my husband isn’t! Thanks for sharing! This looks so good! I loved Striped Delight and adding Butterfingers to it had to have made it outstanding! I love butterfingers! This looks delicious!